I’m on a quest for healthy (ish) school lunches for Goose and in particular – sandwich substitutes. So far the stand out favourite has been the ‘Mini Egg & Bacon Pies’. This is a recipe that has been in our family for as long as I can remember. These were requested at every single birthday party without fail when we were growing up and my sisters & I have carried on that tradition. * They are always a hit and perfect to freeze and pull out for school lunches, when friends come over for lunch or when you need to bring a savoury plate. They are great warm and great cold. 1. Set oven to 190 C.
3. Beat eggs & add all other ingredients. 4. Line a greased muffin tray with pastry rounds. I use the top of a wine glass or a scone cutter. 5. Put tablespoon or so of mixture into each one & cook for 15 mins. * This can be made into one large pie also. Just blind bake the pastry first for approx 10 mins and cook at 180C for approx 40 mins. Coming close second in the lunchbox stakes are Zucchini & Ricotta Muffins… stay tuned later this week for the recipe. I am keen to try these, these & these which I think could be winners also. What are your lunchbox winners? If you’ve got a healthy lunchbox recipe, whether sweet or savoury, that you’ve already posted about – please link it up below. Or you could always write a new post – just to link it up here! It would be great to have a resource of lunchbox ideas, that are tried and true by bloggers & their kids, that we could all go to with just one click! We LOVE these so much in our house now. Always requested for birthday parties too. Abbey likes them for dinner, and I can eat them anytime of the day – so yummy! They are even naughtier with puff pastry. Such a good recipe! Well, I think this is right up my alley;) I will check back soon with some of my suggestions.<br />I definitely like the idea of alternatives to sandwiches. But saying that, my son is so easy at the moment, he doesn&#39;t mind sandwiches every day! What an adorable blog you have! 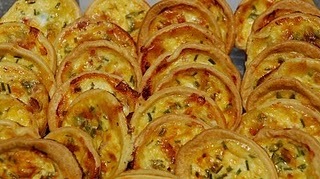 Those mini quiches look divine! My little girl needs variety all the time too! When she was an infant she wouldn&#39;t eat the same baby food two days in a row! I need variety, I&#39;m excited to follow your blog! I am so bored with lunches at the moment that I must, must give these a go! Thank you for the recipe. How much is a rasher of bacon? Hi Lori Ann, a rasher of bacon is just a slice of bacon. You don&#39;t need to be too specific with this recipe. Use as much or as little as you like. I often double the bacon when i make these. Can these be frozen? If so, what would the reheat instructions be and how long do you think these would last in the freezer? Hi Sharon, so sorry that i have only just seen this comment now! yes, these can definitely be frozen as i do it regularly. just defrost them in the fridge the night before or pop them in the microwave for 20-30 seconds.